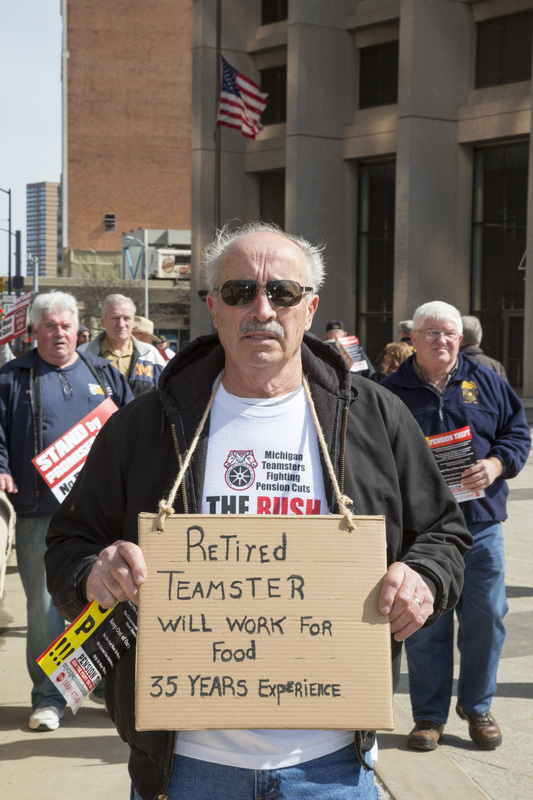 As they picketed in downtown Detroit Friday over cuts to their pensions, some retired Teamsters were quick to point out that they were not the worst off. “I’ve still got my health and a part-time job that keeps me busy,” said Jim Carothers. Carothers is facing a 60 percent cut to the pension he earned over 34 years as a carhauler, driving finished autos from the assembly line to dealerships. On July 1 his benefit would fall from $40,000 a year to $16,000, under a proposal from the Central States Pension Fund. But “I’m one of the lucky ones,” he says. Carothers cites fellow Teamsters who will lose their homes, and a couple who are caring for their 39-year-old severely disabled daughter. “What’s going to happen to those folks?” he asks. The Detroit picket was one of five this weekend called by angry Teamster retirees under the rubric of “March Madness,” with actions also held in Kansas City, St. Paul, Columbus, and Dunn, North Carolina. They are part of a wave of organized wrath over the Central States Fund’s plan to slash existing retirees’ pensions by 50 to 60 percent. “We haven’t seen this many people coming out to rallies, ever,” said Pete Landon of Teamsters for a Democratic Union, which is helping the organizing. Eight hundred filled a hall last month in Detroit. Columbus and Kansas City drew 500 and 1,200, Minneapolis 750, Milwaukee 300, Cincinnati 200, Houston 300. Retirees have formed “Committees to Protect Pensions” in 20 cities, with Facebook pages set up in a dozen more. They plan to descend on Washington, D.C., April 14 to support the Keep Our Pension Promises Act (KOPPA) and to ask the Treasury Department to reject the Central States proposal, which will hurt 410,000 Teamsters in 25 states from Florida to Minnesota. In February, Rita Lewis, widow of a Cincinnati retiree who was a leader of both the pension movement and the Teamster reform movement, asked the Senate Finance Committee for bipartisan Congressional action to help the retirees. The movement has generated two bills in Congress. KOPPA, introduced by Senator Bernie Sanders and Congresswoman Marcy Kaptur of Ohio, would solve the Central States’ underfunding problem by providing backstop money for the Central States retirees whose companies ran away or went bankrupt. The money would come from closing certain corporate tax loopholes. A second bill, introduced by Republican Senator Rob Portman of Ohio, would at least give retirees a fair vote on the issue, allowing them to say no and work for a better solution (as it stands, their vote can be vetoed by the Treasury Department). Many Congressional reps and senators have signed on to the retirees’ call for Treasury to reject the Central States plan as presented. “The retirees have learned how to be citizen lobbyists, backed by a movement,” said Landon. They have been aided by the Pension Rights Center, which has provided both organizing savvy and technical help on alternative fixes to the problem. Teamster retirees are rallying by the hundreds and thousands against the Central States Fund’s plan to slash existing retirees’ pensions by 50 to 60 percent. Photo: Jim West, jimwestphoto.com. Terry Elswick, 57, spent 33 years as a claims clerk for a freight company. Now she walks with a cane. “It broke my heart to retire,” she says. She could not go back to work after a broken back, and says the Fund encouraged her to take early retirement. Her husband points out that the Fund’s resources plummeted while it was supposedly under the watchful eye of the federal government. A 1982 consent decree, designed to rid the Fund of corruption, turned over management of much of its assets to Wall Street firms such as Goldman Sachs. These firms collected more than a quarter-billion dollars in fees just in 2009-2013. The Upstate New York Pension Plan, covering 35,000 Teamsters, has just announced its own first steps to slash benefits, as have a small Teamster plan in New Jersey and an Ironworkers fund based in Cleveland. The Boston College Center for Retirement Research lists 100 troubled funds that could apply to cut members’ pensions. A United Mine Workers fund, for example, has 115,120 participants, almost all of them retired; fewer than 12,000 are still working and thus paying into the fund. Wayne and Jeni Ottney drove from Eaton Rapids, Michigan, to join the line. Wayne said he retired when his freight company started laying off, so that a younger man could have his place. Now, facing a 50 percent cut at the age of 65, “they try to tell me I can go back to the job. Now he worries that one of those children also has a target on his back. His son is a union Sheetmetal worker whose pension is also in a multi-employer fund.